The worse thing that can happen to you after installing wordpress would be (drums roll please): Forgetting your password. I always have this prinicple to reset the password after a fresh installation. WordPress gives you a generated password for logging into wp-login.php once it’s installed. 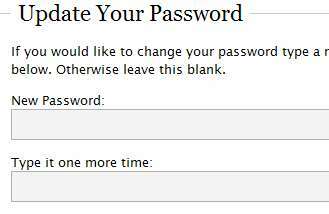 What you need to do is – reset and assign a new password. 2. Goto Users -> Your Profile and key in your new password. 3. You will be logout automatically. Relogin using your new password.